It’s that time. You’ve heard the rumblings over the past couple of months… you’ve (hopefully) seen bits and pieces of the art… and you’ve (even more hopefully) heard the buzz. 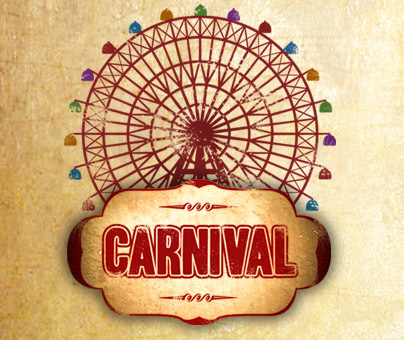 Our first game release, Carnival, is now on Kickstarter and ready for your perusal! For those not in the know, Carnival is a game of set collection for 2-4 players that utilizes dice rolls to determine actions. 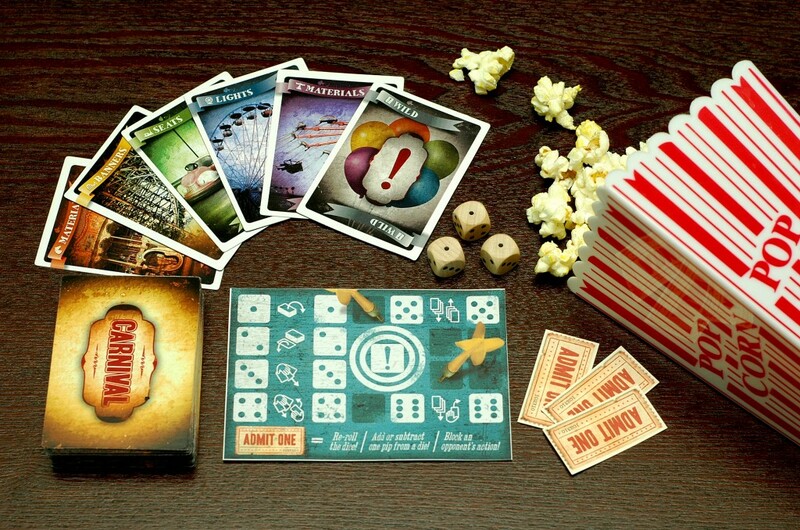 During the game, players may use Tickets to influence dice rolls or cancel other players’ actions. Wild cards can act as card substitutes or be discarded to draw more cards from the deck. It’s just like bumper cars in a box – and, best of all, it was created by Monkey238! Carnival is a lot of fun, and we have no doubt that you, your family and friends will enjoy the approachable, yet strategic gameplay. However, if you choose to lend your support to Carnival through Kickstarter, you’re not just backing a product – you’re backing an idea and the future of a company that wants to bring you challenging, innovative and entertaining products for many years to come! 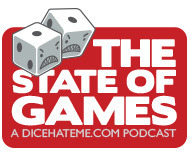 As always, thank you for reading Dice Hate Me – and regardless of whether you choose to back Carnival, you can rest assured that Dice Hate Me will continue to bring you all the quality gaming news, reviews and previews you’ve come to expect since our inception. Enjoy your ride! Looking forward to getting my copy. Played the prototype with GamrrChris, Tom Gurganus, and Keith last night at Hypermind. I must say, it’s the first play, and if it was on the shelf already in retail, it would have came home with me last night to take to my friends at work in Minnesota next week. This is the first thing I have ever backed on Kickstarter! Supporting my local peeps – get your bulls up, guys! Shawn – Thanks for backing, and we’re glad you had a chance to play and enjoy Carnival last night! Jason – Yeah, Durham love! Thanks for making us your first Kickstarter backing experience. I’ve played (and, of course, loved) Fiasco a few times since sharing a game with you at MACE, but I still need to introduce Cherilyn to the seedy underbelly. We need to rectify that soon. Let us know if you’d like to catch up and grab a beer at Fullsteam or Dos Perros sometime!